A dental bridge is one or more false teeth called a pontic, which is typically attached each end to a crown on a tooth adjacent to the space. 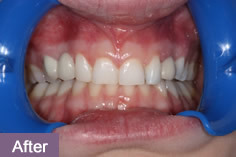 Sometimes they are only fixed to the teeth one end of the space, and these are called straight cantilever bridges. A well designed and well cared for bridge will last many years and is a very good method of typically replacing one or two teeth. They can however be made to replace more teeth than this, if there are enough teeth in your mouth to attach them to. Bridge technology has improved in recent years, and while a lot of bridges are attached to teeth using crowns, which involves preparing the teeth for crowns to retain the bridge adhesive dentistry provides other solutions to how we can hold a bridge on to your teeth. 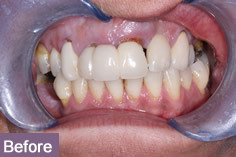 A resin bonded bridge is often used in the front of the mouth and involves very little preparation of the teeth as a “wing” bonds to the inside of the tooth next to the gap. Sometimes if a tooth next to the space has a filling in it, we can simply remove the filling and use the cavity which is left to hold a bridge in place with a porcelain inlay. (see our smile gallery). 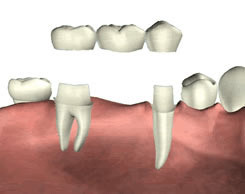 If a tooth is missing near the front of your mouth the main reason to replace it is cosmetic. If the gap is nearer the back of the mouth and does not show, then the main reason to replace a missing tooth is to avoid problems with the teeth each side of the gap, or in the opposite jaw to the gap. Teeth only remain where they are in your mouth because they all support each other, if one is lost then commonly the teeth each side of the space start to move into the space and tilt. This can lead to food getting trapped between your teeth, and gum disease round the tilted teeth. The way your teeth “bite” may also change. Am I suitable for a bridge? 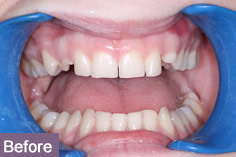 Bridges are ideal if there are one or two teeth missing, or when the missing teeth are only on one side of the mouth. The teeth and gums must be healthy enough to support the bridge. At your consultation visit we take some X rays of the teeth, and do some other checks to make sure that if we are going to make a bridge for you, that we can be sure it will function and look nice for many years. How does a bridge fit? 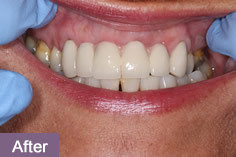 The traditional bridge is fitted over your prepared teeth either side of the gap. There are some modern style of bridges, which are made from different materials which do not require preparation of the teeth, they attach adhesively to the teeth. Bridges are divided into different types depending on what they are made of and how they fit. Bridges towards the back of the mouth typically have a precious metal substructure covered with a layer of porcelain coloured to match your own teeth. Nearer the front where the teeth are not subject to as much chewing force, but where appearance is more important, we always try to use one of the all porcelain materials. These look much more natural, and mimic the translucency of your own natural teeth. They are more expensive , but the appearance is worth the extra cost. Metal and porcelain bridges cost from £350 per tooth. All porcelain bridges cost £450 per tooth. Although this may seem quite expensive, a well designed bridge will last many years. Each bridge is carefully prepared and custom made to fit and restore your smile. A typical resin bonded adhesive bridge, which is primarily used to replace one missing front tooth can cost less than a fixed bridge. 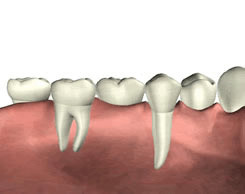 All porcelain bridges are now made using the Lava technology from 3M similar to Lava crowns. The substructure is made from acomputer milled piece of solid zirconia colour matched to the teeth. Bridges made using this material can be suitable for up to 2 missing teeth.